Twitter’s first real monetization and advertising deal is officially official on CNN. As well, Search Engine Journal had a brief post about the new deal. ExecTweets is a special Twitter page (it has its own domain) that compiles tweets from the world’s top executives… or at least the ones who use Twitter. The site also has an About ExecTweets page that tells you all about it. The page features branding from Microsoft. I have to admit, this isn’t what I expected would be Twitter’s first foray into social media monetization. I’m actually surprised they did it so soon – I expected them to go the route of Web 2.0 giants like Google and Facebook and focus on really streamlining the service first before monetizing it. I like this better than ads. I was not actually looking forward to random businesses trying to sell me stuff whenever I posted – I just don’t think that that the algorithms would be good enough to only send me ads when I really want them. We’ll see how this goes. 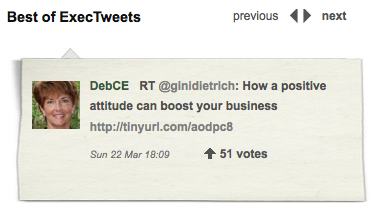 I’m curious to see what other ____Tweets.com pages start showing up (if any).